A break through in billets that you need to know if you do billet effects. Richard Osterlind is correct when he says that many mentalists stay away from Annemann's billet work because it seems hard to do. For most magicians and mentalists, it is difficult to do. They struggle with opening the Annemann billet in their pockets; they fumble and quickly give up. The basic idea is to switch a billet for a blank one and secretly open it in your pocket or behind a clipboard or book. This can be difficult with one hand, especially if you are using an Annemann billet. That has all changed thanks to Ron Levy, a good friend of the late Gene Gordon, who personally knew Annemann. Ron introduced a new billet that he named for Devin Knight, The Knight Billet . He found that secretly opening a billet in his pocket was no longer a problem. He could do it quickly and without fumbling, just as Annemann said it should be done. In his opinion, this billet is far superior to the standard Annemann billet. 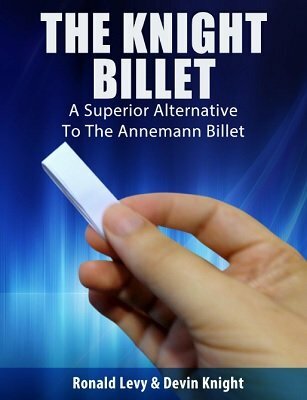 This PDF is designed to teach you one thing, how to replace the standard Annemann billet, with The Knight Billet . In this PDF you will not find any new or original billet effects. None are needed. Annemann's books are full of excellent billet effects that most performers have overlooked because of the difficulty of doing them. This PDF is designed for the performer who wants to work with billets and do the many excellent Annemann billet effects. You need only refer to his books, read the methods, and replace them with The Knight Billet . The authors also show you a new and clever way to practice your billet work that is worth the price of the PDF. Get this PDF and add many of the Annemann billet effects to your repertoire that in the past you thought were too difficult to do. That is all about to change once you know The Knight Billet .